It has been a very busy month and it ain’t over yet! Six weeks ago, if you’d told me that I would be running TWO brick and mortar booths at Crafted at the Port of Los Angeles, I’d have laughed at you! ONE booth was overwhelming, but taking on the second with only 5 days notice till Grand Opening was kind of a huge leap of faith. I feel fortunate to have such great, cooperative artists on board. It’s been challenging but having them all so committed to helping me out and make this great has really made a huge difference. Each of my artists at Night Market puts in two “Meet The Artist” days per month. When they’re there they do a little creative work, man the Night Market booth, talk to customers and help ring up some purchases. It helps! I’ve been tinkering with both spaces ever since Opening Day, things are still very much a work in progress. The addition of a small portable jeweler’s bench last weekend made things very nice for me over in Honey&Ollie – now I have a small space set up behind the cash desk to sit and work when there aren’t customers in the shop. Being able to work on site has simplified my life a lot. Getting sufficient studio time during the rest of the week is often a challenge. Last week I had to make a tough decision, and pull my stuff out of The Majestical Roof in Pasadena. It was quite validating and lovely to have a real store carry my designs and it was exactly where I needed to be at the time, when I began with them. But, for various reasons, we are no longer such a great fit for each other. Life happens like that, sometimes. I do wish all the MR crew so much success in their magical little courtyard store. What this means is that, right now, Crafted is the only brick and mortar location where you can find Honey&Ollie designs. There are a couple of very nice shops that I am considering working with, however, and I am working on an exclusive line to that end. I’d love to spend some time nurturing my virtual universe back to life. The blog, the Etsy shop, the Facebook page have all been feeling neglected while we were so hyper-focused on getting Crafted off the ground. Well… the Etsy shop is open again, and I’m hoping to get new products listed this week. I’ve got some fun new pieces, if I can just find the time to shoot them, edit, and make listings! Create actual blog content. All that would be SO great! And of course, the ever present conundrum of how to get more time actually IN the studio, at the bench, doing stuff that can’t be done at Crafted. I guess those would be at the top of my list of things that must be sorted out, hasta pronto. Especially because, and here is the huge thing, I am starting at Revere Academy of Jewelry Arts in San Francisco this October, and will be taking workshops and classes with an eye towards getting my Graduate Jeweler diploma. Since they have a super convenient open session kind of schedule, I can do this around my own time and budget, but it is definitely going to put even more of a time crimp into things. I’ll be traveling to the Bay Area every few months for intensive workshops in various jewelry making arts. What this means for Honey&Ollie is, of course, awesome! Having the ability to execute more design ideas, use traditional metalsmithing techniques and an expanded toolkit of skill sets is going to open a lot of doors for me. I’m very excited about this! Rings, bracelets, bezel set stones… OH the places we’ll go! I’m not sure what running two shops and doing an intensive educational program 500 miles away is going to look like. But I imagine it will be a little bit like bungee jumping off the top of a 6 Flags roller coaster. Or something. No matter what, I imagine that Captain Sexypants and I will still make time for dancing. 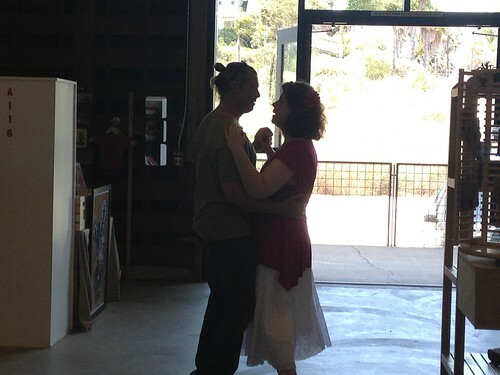 Even if we only have time to dance at Crafted during Friday afternoon lulls for a while. 12 Responses to It has been a very busy month and it ain’t over yet! Congratulations on so many points. The Crafted space and taking the leap to go to Revere. I took a bunch of classes there in the ’80’s and learned a lot. They have excellent teachers & lots of connections. Good luck to you, you’ll love those classes. thanks! I’m so excited about it. I’m mostly self taught and all but one of the classes I have taken were online. Getting the opportunity to learn in a studio in real time is just so exciting to me. How wonderfully exciting, Rain! I’m glad you’re going to take the class – will you be able to do it online or will you have to go there? I can’t wait to see the new pretties that you think up with the new training. I know they’ll be gorgeous! It’s in person, up in SF. The classes are generally 3-5 days in length. Wow – you re rocking it Rain!! So happy for you! I sooooo want to come along with you to those classes…how awesome is that going to be for Honey and Ollie!!!???!!! Can’t wait to see you grow grow grow!!! i wish you much success! Anxious to see what else you’ve been creating. Very nifty to think of the continued learning and what that may bring to your creative process. Were the skelly-pansies yours? Loved those. Wish I could hang out and see the new stuff! I just know there’s something there “with my name on it.” 🙂 Exciting to see your new space come to life. Glad you still have dancing energy, too. I am so very excited for you. Happy you are also taking time to dance, so very important.